This blogging thing is lots of fun. Over the past couple of years, I've had the pleasure of interacting with tons of ladies who reached out to me while on their wonderful hair journey. I love that, because of the wonders of the internet, we don't have to go through this journey alone. I learn from you as much as you have learned from me. I'm also humbled that this simple little blog has attracted the attention of people and companies who I probably wouldn't have the opportunity to interact with under different circumstances. Blogging about hair is somewhat of a strange topic but, as you may have already noticed, there are a whole host of hair related blogs available online, more specifically, textured hair. There are quite a few sites online that focus on the care and beauty of natural hair. Kagem, the author of charcoal-ink.com, a blog dedicated to the topic of natural hair, submitted an article to British based Black Beauty and Hair magazine on the natural hair blogging phenomenon that has taken the online world by storm. 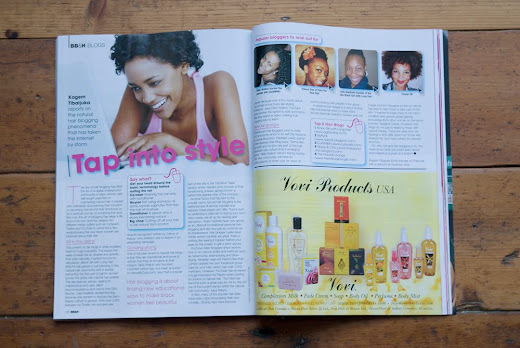 The article features insights from such blogging greats as Curly Nikki, and famous blogs like Black Girl with Long Hair and Mane and Chic. I'm honored that along with these natural hair mega-bloggers, Kagem also reached out to little 'ole me to provide my viewpoint on the phenomena that is hair blogging. Thank you Kagem, for finding value in a blog focused on care of relaxed hair and including me in your natural hair blogging article. Check out Kagem's article in the December/January issue of Black Beauty and Hair Magazine. I for one owe the discovery of this exciting hair journey to you and your blog that I stumbled on months ago. Thank you very much! You go lady!!!!!! Thank you for all your tips. Congratulations~I love your blog because you always have valuable and helpful tips. Thank you for sharing!